Whether you know exactly what kind of diamond you want, or are just starting on the seemingly complicated journey of finding the perfect diamond to invest in, the online tools and expert stone consultants at Krikawa can help you find your perfect stone with the ultimate in peace of mind. Why try to wade through the piles of online information when you can rely on our expert eyes to pick a diamond for you that has maximum fire and sparkle? Use the Diamond Search Tool If you know exactly what type of diamond you are looking for. Krikawa is connected at the core to a vast worldwide inventory of diamonds. The Diamond Search Tool lists a curated collection of those diamonds. If you don't see what you're looking for there, your design consultant can find it in the diamond interweb. Let the Stone Wizard help you find your perfect diamond, step by step. Let one of our diamond experts help you select the diamond that is just right for you, your style and your budget. We understand the complexity of diamonds, and after making thousands of unique diamond rings, we know what looks good and how to help you find the best diamond. With the purchase of a diamond comes a whole host of mysteries, questions and misconceptions. At Krikawa, we’re not simply in the diamond business, we're honored to help you create the ring that represents your love. You’ll receive our help in selecting a diamond that we’d pick for ourselves. From the rarest to the most conservatively priced stone, our experts will help you find the perfect diamond. Ready to start working with one of our experts? Email now or call 1-888-krikawa. While our design consultants are happy to help inform you about the best diamond for your investment, you can also do some research on your own. In our diamond education section, you can discover everything you need to know about the 4 Cs: Cut, Color, Carat Weight, Clarity. Why does Krikawa recommend GIA Certified Diamonds? 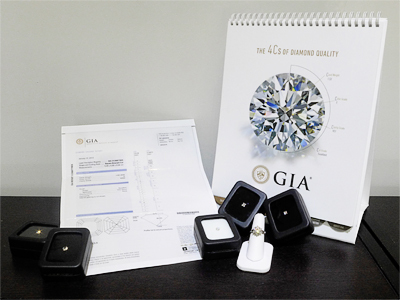 Learn why your white diamond should be certified by GIA or AGS. What diamond shape are you considering? Want to see all the shape possibilities? Click here to learn more about Diamond Shape. 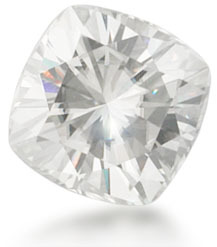 If you are considering a princess cut or cushion cut diamond, you must check out the patented FireMark diamonds. These are the most perfectly cut diamonds on the planet! And if you are dreaming of a three stone engagement ring, our unique, unusual, and perfectly Matched Diamond Pairs will be for you. As a member of the RJC (Responsible Jewelry Council), we uphold the standards, practices and ethics essential to the integrity of the jewelry industry. If color sparks your interest, consider a fancy colored diamond. Krikawa is a provider of the finest fancy colored diamonds available. Krikawa is a leader of Diamond Alternatives for engagement rings. We are your experts when it comes to what kind of alternatives to use, and we have an enormous database of eclectic and alternative stone choices. Contact your design consultant to help you find the perfect unique and unusual engagement ring stone. For the ultimate in eco-friendly diamonds, our lab-created diamonds are are a sustainable, earth friendly option. Optically and molecularly identical to an earth grown diamond, a lab created diamond is an earth conscious and a pocket conscious choice! Email us today for a price quote on a lab-created diamond. You'll be pleasantly surprised! What Diamond Will Sparkle in Her Eyes?